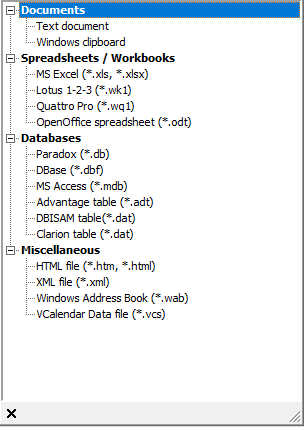 Only check the Empty table before import option if you are really sure that any data existing in the specified table is really no longer needed. The option Convert strings from ANSI to UTF8 will be set ON automatically when the target database needs data in UTF8 (i.e. the connection charset UTF8 or UNICODE_FSS). Below this you will find three pages: Import from, General options and Columns / Mappings, below which you can preview the selected data to be imported. Then select the path, directory and file name of the file to be imported. File formats not included here can be imported using ODBC access. Please refer to Import and export using IBExpert for further import options using IBExpert. Here you can define which rows are to be imported. Default values start at row 1 and finish at row 2147483647. On the right-hand side of this page the Date order, Date separator and Time separator can be specified. The Decimal separator option was added in IBExpert version 2014.09.15 for data import from text files. If the Trim string values if they are too long option is enabled, IBExpert will silently truncate strings if they exceed the target field length. The Trim trailing spaces and control characters option was implemented in IBExpert version 2015.03.14. If enabled, IBExpert will remove trailing spaces and control characters from string values. Here you can alter the Field name and Field type of the target database fields corresponding to the source database field names if necessary. It is possible to convert Boolean values to smallint values when importing data into a new table. When there are Boolean columns in the source record set, the Convert Boolean values to integers checkbox will be visible on the Columns/Mappings page. The Generate simple column names feature is available in the Columns / Mappings context menu (click on Target fields and right click) and generates simple column names like COL1, COL2, ..., COLN for the target table. The IBEBlock page contains automatically generated IBEBlocks for data import. Since IBExpert version 2016.03.15 the composed IBEBlock now also contains fields mapping information. In the lower part of the window you can preview the data sets to be imported, checking field names and contents before finally starting the import ([F9]).